Make your way through enough writing on Diane Simpson’s work, and you’ll find a single descriptor comes up time and again: elegant. Outwardly, it’s a word denoting presence, poise, a tasteful display. More importantly, it’s also a term equated with the appearance of effortlessness—“appearance” being the operative word. Elegance, after all, lies only in what seems artless: in truth, it is literally a mark of refinement, of the systemic removal of excess and accident. Its effect is essentially one of casualness-as-construct: distinguished ends reached by design, practice, and controlled execution. In this sense, one could hardly ask for a more apt sum-up of Simpson’s output. 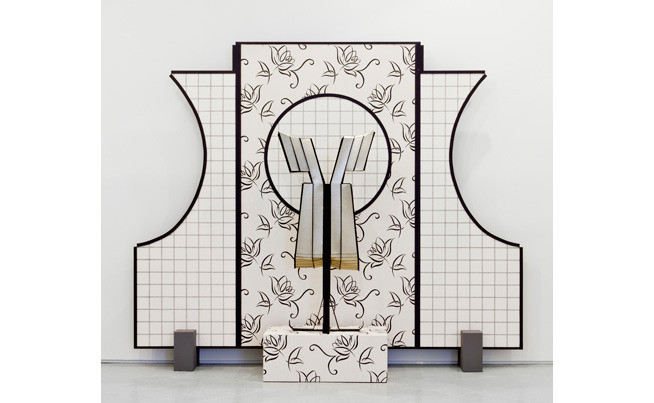 Over the course of her 35-year career, the Chicago-based artist has demonstrated a particular skill for offsetting precision with personality, her highly stylized sculptures, drawings and installations achieved through a deceptively rigorous studio practice. Working from a varied range of sartorial and architectural sources—17th-century court dress, Art Deco displays, Amish bonnets, modern-day aprons—Simpson’s process is one of repeated translation, looping between two and three dimensions, abstracting familiar designs into finely crafted, newly androgynous forms. Point of reference in place, she begins each new work with a preparatory drawing. The sketching process is exploratory but specific: flattening, dismantling and reforming each muse on graph paper, Simpson’s approach falls somewhere between isometric projection and Cubism, all overlying perspectives and revised volumes. While compelling in their own right—she regularly exhibits them as legitimate works—these drawings serve as blueprints for structures to come: adopting a bevy of materials (wood, wool, fiberboard, faux fur, layered fabrics), she meticulously transposes the penciled schemata back to physicality. Here, the same methods of pictorial illusion used to convert object to image are applied once more to construction in space. Oblique parallels, purposeful asymmetries, foreshortened perspective: Simpson proves herself an exceedingly resourceful craftsperson, with tricks normally used to describe space now used to activate it. Presented variably as freestanding, wall-hanging, and shelf-based constructions with inventive (often integrated) supports, bold geometrics, and rich ornamentation, the finished works offset decorative impulse with careful design, the results at once stylish, stoic, and strange. While exquisitely finished, Simpson’s offerings are, at least formally, all about the active perception of volume in space: exploiting the paradoxes inherent in both the 2-D representation of mass and its inverse, the works reward careful and varied inspection, their forms apparently receding and expanding depending on one’s angle. Connotatively, the fun lies in the overlaps, the mixed readings produced by Simpson’s merging of abstracted sources and varied materials: Patrick Hill coupled with Lyubov Popova, Otto Wagner filtered through Ottoman art. In the end, it’s this denial of readings both linear and literal that proves the work’s greatest appeal: with reference and vantages constantly shifting, Simpson’s work favors the spaces between, straddling abstract and figurative, mechanized and manual, industrial and domestic, familiar and foreign. Even with knowledge of her considerable labor, one feels a kind of inevitability in viewing Simpson’s work. The interrelation of structural elements, the materials layered and hanging just so: there’s a subtlety here, a sense of fated realization that offsets the utter precision of their making. It can be difficult to reconcile—but then, that might be the point: when it comes to elegance, impact always lies somewhere between effort and effect.